Here begins the first of several write-ups from my flying visit to the States recently. I will do my best to blog these posts ASAP. But you know how it is – with work and a busy schedule, it will probably take me longer than I would like. Please bear with me. 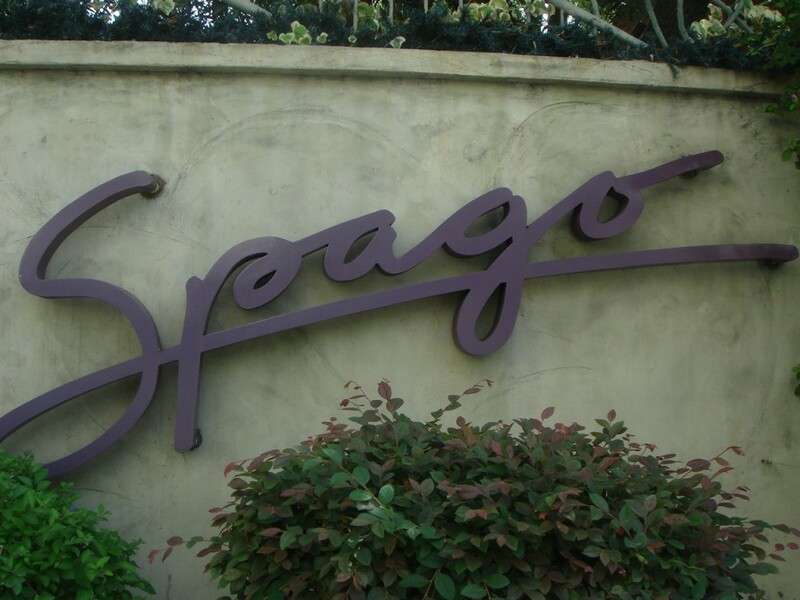 In the meantime, I hope you will enjoy the taste of the first instalment – SPAGO. Puck’s name is indelibly marked everywhere. His empire extends across the US, and covers a range of eateries (casual to fine dining), catering products, supermarket food ranges, cookware, and of course, cook books. So I was sceptical about Spago. Could it possibly live up to all the hype? Would it really be that good? It held two stars in 2009, but was that based purely on the fame of the chef’s name as sometimes Michelin restaurants tend to be? (Note that in a backwards, cost cutting measure for Michelin, the guide stopped reviewing the city of Los Angeles in 2010. Therefore there are no restaurants in LA with stars (Michelin ones, that is) at the moment). I debated long and hard about whether to go to Spago, especially given my time limitations, but in the end I decided to try it. After all, this restaurant embodies everything that is LA. But I digress. Spago is a magnet for the stars, evidenced by both the paparazzi as we were leaving, and Avril Lavigne and Brody Jenner (who are dating – and I only know this because my sister told me) walking through the front door at exactly the same time as us. The presence of Brody Jenner caused my sister to swoon, and me to never hear the end of it. The dining room is stylish and sophisticated in a glamorous old Hollywood kind of way. There are artworks and jewelled designs dotted throughout, and a garden al fresco dining area for when the weather is nice (but when is the weather not nice in LA?). At the back of the restaurant is the kitchen which is partitioned off from the dining room with a large wall of glass that allows you to see the goings-on of the kitchen staff. We went for the five-course tasting menu ($90) which seemed the best option for both variety and price (mains on the a la carte menu range from $37 to $110). The tasting is a surprise, so we had no idea what we would be getting. 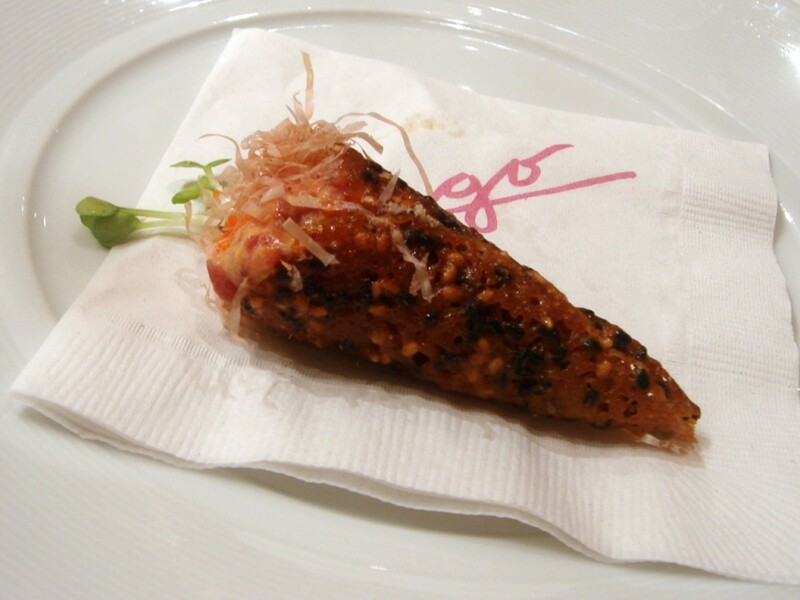 To start were the amuse bouches, the first of which was a tuna tartare in a miso sesame cone. The tuna was tasty and fresh, but there was a little too much wasabi in the mix which slightly overwhelmed the tuna. The cone was crunchy and aromatic from the sesame. Next was a bacon confit en croute, bacon cooked in its own fat and wrapped in puff pastry. The bacon was extremely tasty, but being bacon, was naturally a little salty. The pastry was lovely and light. 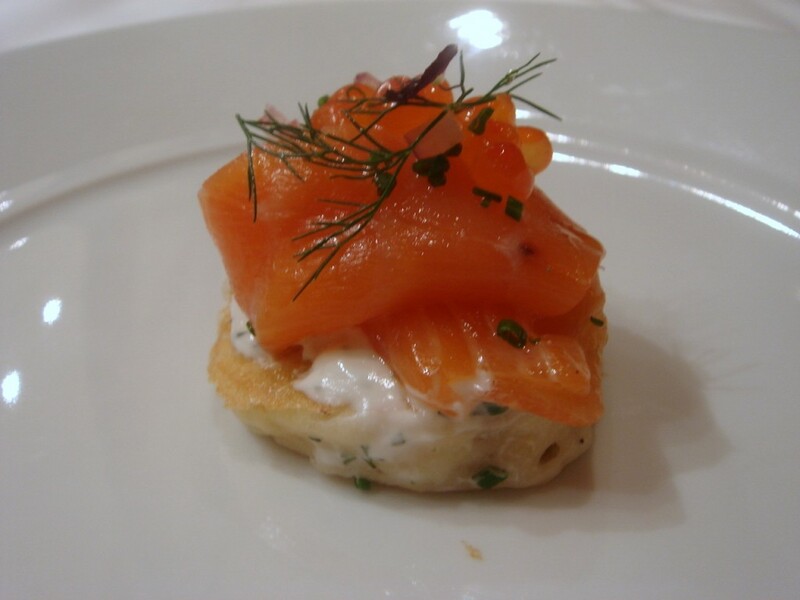 This was followed by a smoked salmon blini (smoked salmon, crème fraiche, chives and dill), which, for all its simplicity, was absolutely delicious. A foie gras parfait with apple and pear compote sandwiched between rye crispbread was a touch peppery. But the foie gras itself was lovely and creamy, and the acidity of the compote worked well to cut the richness of the parfait. Overall, the amuses were good, but not amazing. The palate cleanser was a Japanese cucumber sorbet with a finely chopped cucumber and shiso ragu, finished with a drizzling of oolong tea. Truth be told, the sorbet was an oddity and I didn’t understand the purpose of it. 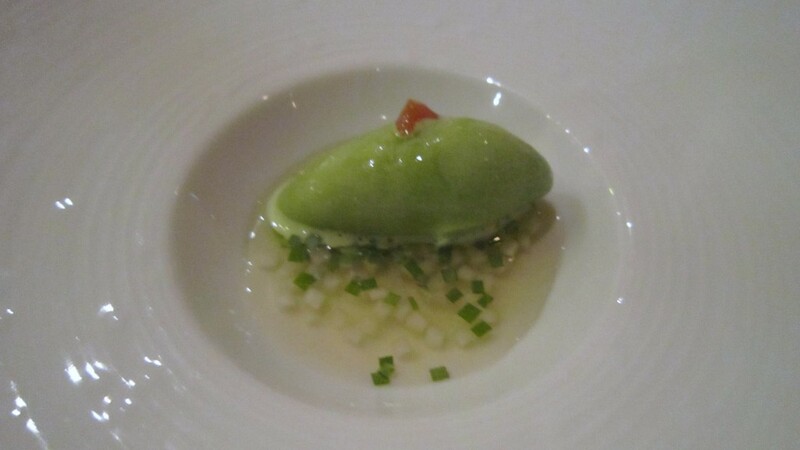 I have never been a fan of cucumber as a sorbet or dessert ingredient as I usually find it bland (flashback to the cucumber pre-dessert from Noma which was not very appealing). Also, the use of shiso in this instance (one of my favourite ingredients in Japanese cooking) overwhelmed the sorbet making it slightly unpleasant. 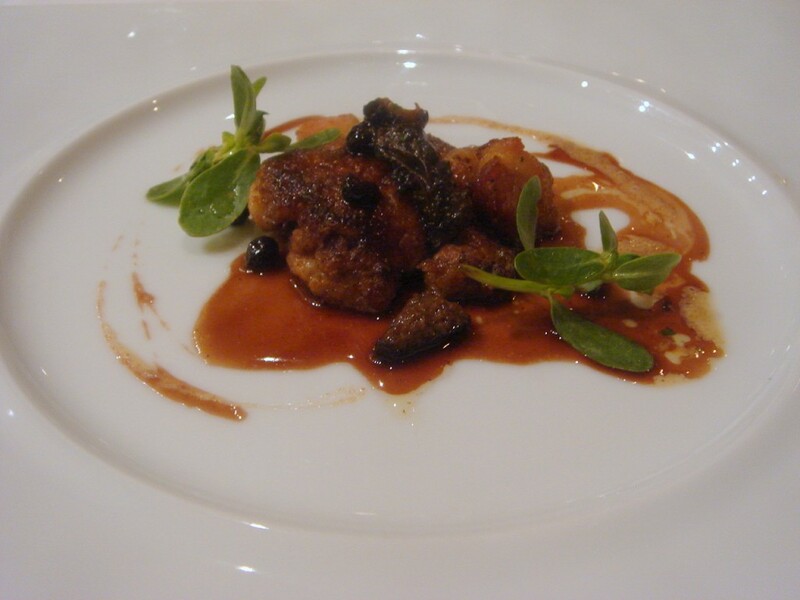 The first course was sautéed veal sweatbreads ($21*) with wild morel mushrooms, confit bacon and pearl onions. The sweatbreads were firm in texture and tasty. It worked well with the meatiness of the mushrooms, and the earthy rich flavour of the bacon which was simply to die for. A fresh purslane salad gave the dish some crunchiness. The dish was nicely finished with a huckleberry reduction which had both a touch of tartness and sweetness to it. Roasted Maryland crab stuffed Maine skate wings ($38*), a combination of beautiful sweet crab and meaty fish, resembled a protein-rich crab cake. Browned to give it a crispy exterior, the only downside to it was that it was over seasoned. 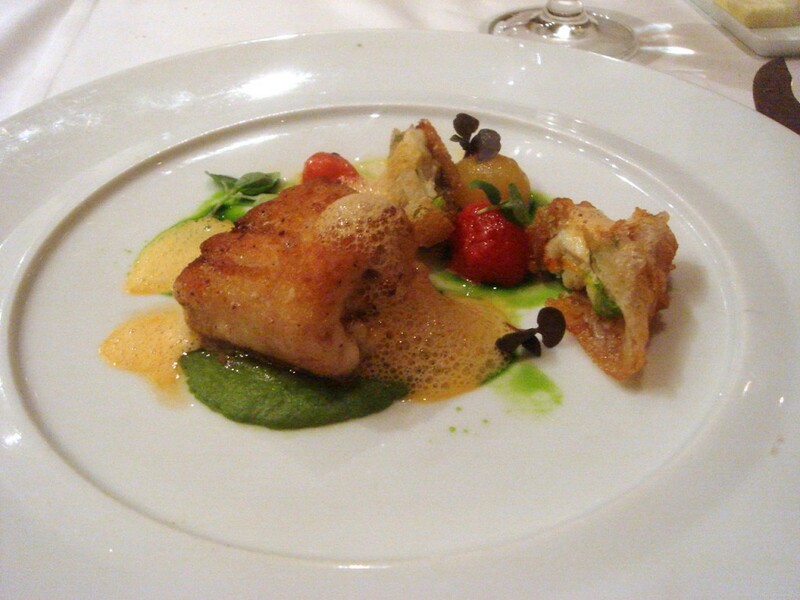 The accompanying elements in the dish included some squash blossums in tempura batter, deep fried to a crunchy light perfection, some astoundingly delicious confit cherry tomatoes which were sweet and soft, a pleasant baby zucchini puree, and a pleasing shellfish reduction. 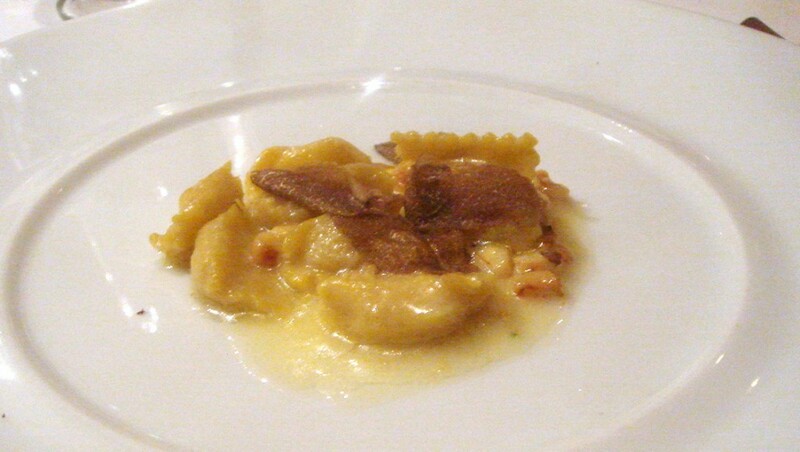 Handmade agnolotti with sweet corn and marscarpone, finished with summer truffles ($34) was simply, simply wonderful. The pasta itself, cooked to an al dente perfection, was excellent, and the wonderful filling of a light and creamy marscapone with soft sweet corn was magical. The final flourishes of a buttery, sage and sweet corn sauce, and shavings of summer truffles capped off this excellent dish. The meat course had me gasping. I couldn’t believe it when the Lone Mountain 100% full blood New York Wagyu turned up in front of me. This is normally priced at $110 for 8 ounces. I think our two slices probably came in at about 4 ounces, so a half serving, but I was still suitably impressed that we were served this dish as part of a $90 menu. Value for money indeed! 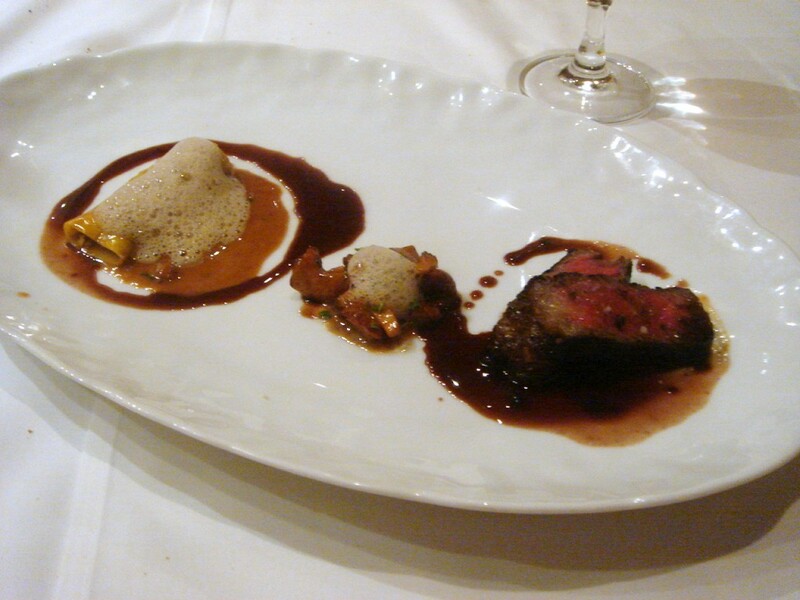 The wagyu was wonderful, I relished each fatty little bite, which was accompanied by a rich reduction of red wine Bordelaise sauce, Piedmontese cannelloni with mushroom sauce, and some creamed chanterelle mushrooms. The only thing that let this dish down was that the food was slightly cold. 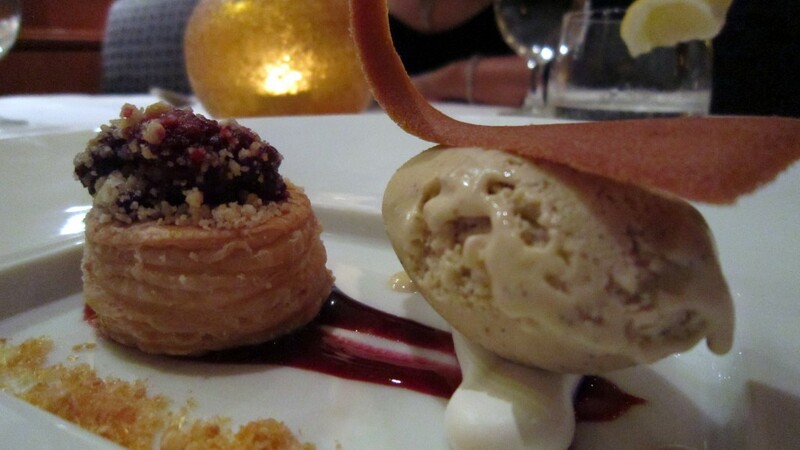 Dessert was a boysenberry tart which consisted of a few pieces of sweet boysenberry on some flaky puff pastry. It was served with meringue, vanilla ice cream and vanilla tuille. The dessert was pleasant but unremarkable. It really didn’t showcase the talents of pastry chef Sherry Yard. To the service. I must confess to having reservations about what this would be like before going to Spago. Given some of their usual high end clientele, I was worried that it might be snobbish and stiff. But actually, it was wonderful. I felt like I was being fawned over the entire evening and that we were ‘important’ people. It was truly hospitable, charming and professional, and I was blown away by the fact that we were served the wagyu, which I am convinced is not usually part of the tasting menu. There were some amazing aspects to this five course menu. And despite the odd errors such as the over seasoning and the slightly cold food, etc, on the whole I enjoyed this meal immensely, especially the fantastic pasta and wagyu beef. But what really sets this place alight is its bewitching charisma – a combination of overall good cooking in a charming setting, accompanied by the type of service that makes you feel like you are someone special. 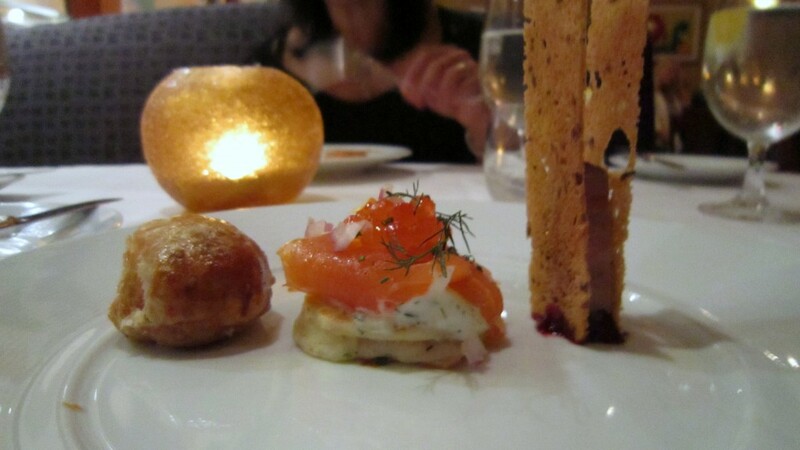 I loved Spago. Despite all my initial doubts about this place, I was delighted that I went. It totally encapsulated that Hollywood magic. No wonder Puck is chef to the stars…Wow. (*the price from the à la carte menu). Excludes drinks, about 10% tax and service. Glad that you decided to try it — and that you enjoyed it so much as well overall. The asparagus soup, the sweet corn anglotti, and the smoked salmon pizza are summer favorites of mine there. Plus, they have the best moscato dessert wine I’ve ever tasted! I can see how some of his restaurants wouldn’t be great. None of his lower end places appealed whatsoever. Did you go to Spago or one of his bistro-y type places?